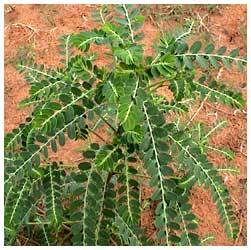 Description: It is a small, erect annual herb with miniature amla like fruits on the underside of the leaves. How to Grow: This plant occurs wild as a common lawn/ roadside weed. In home herbal garden, a bed size of about 50 x 30 cms and stocked with about 50 plants should be adequate. It can also be planted in shallow rectangular pots of the size 50 x 30 cms or shallow circular pots of 40-50 cms diameter. Initial planting material can be procured from the nursery. Care regime: The plant likes moisture and partial shade for its luxuriant growth. Therefore, watering every alternate day will be good for the plant. It needs to be planted afresh after it completes its life cycle and dies. The replanting, however, does not need much effort as the fallen seeds germinate on their own. Collection: This annual herb attains full height in two-three months. The above ground parts should be cut with a sharp knife. New flush emerges providing more than one cut from the same plant.